Camping out - a Sunday family visit to a military encampment? Birte Koch is building an interesting and useful web site Album 1900 which presents various aspects of the history of everyday life in the second half of the 19th and the first half of the 20th Centuries. Photographs, drawings, images and text are used to illustrate the changes in fashions, trends and accoutrements of ordinary people. German and English texts are provided. I'm sure that I will be using the site in the future to help with dating photographs or identifying accessories. Birte sent me images of the front and reverse of a cabinet card by W. & A.H. Fry of Brighton, asking if I could shed any light on the subjects and setting. Here is a very interesting cabinet card by Fry of Hastings. I think it is the 1880s. Some kind of camp picture. I'd love to know what kind of camp this may have been. I have no idea. David Simkin has an extensive history of the Fry family of photographers of Brighton (Walter and Allen Hastings Fry) and London (Elliot & Fry) on his excellent (and growing) Sussex PhotoHistory site, with numerous examples of their work. 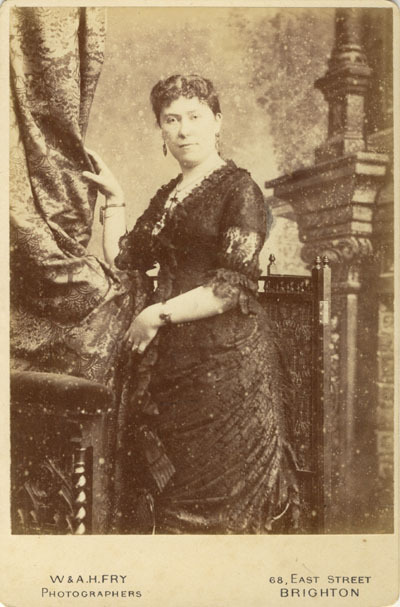 These include two galleries of images, one of which is a cabinet portrait of an unidentified woman with a negative number 35428, dated at approximately 1883. This is very close to the negative number on Birte's cabinet card (35192), suggesting that they were taken at around the same time. The card mount has a very similar, although not quite identical, design to one produced for Derby photographer W.W. Winter and used from c. 1883-1886 (Type XV). The clothing to me looks to be to from around the mid-1880s, an estimate with which Birte agrees, but I'm not sufficiently skilled to be able to provide an accurate date based on that factor alone. I note, however, that the young man seated on the ground and the young boy standing between the man and woman are wearing Scottish kilts, a Glengarry hat, and a tam-o-shanter. This suggests to me that the family is of Scottish origin. The woman seated on a chair appears to have a folded parasol on her lap. The tent is of particular interest to me. I have seen photographs of tents of almost identical design, and white or off-white in colour, used in military encampments from the late 1800s until the First World War. Indeed I have a postcard photograph (above) from around the turn of the century showing a large number of such tents arranged in lines in fields at Shorncliffe, near Folkestone, Kent, England. This is where my grandfather trained with the Canadian Expeditionary Force before going to to France during the First World War. Just a comment about the ubiquitous "bell tent". These have been around for ever, and were still in use as late as the 1970's. I remember several "sleep overs". The tents had a wood floor and the sides rolled up. I remember being at cadet camps in the late 60's early 70's, and there were rows of bell tents. If I remember correctly some of them were actually dated circa WW1. Another CEF Study Group member, John, posted a photograph in the same thread, showing an informal group of CEF soldiers in First World War style uniforms relaxing outside a similar bell tent. Interestingly, once I started looking for pictures of tents of this era, I found no shortage of images in my own collection of old family photographs. The first of these, shown above, is of an unidentified soldier in uniform, seated outside a white canvas bell tent, and with a similar tent in the background. The second, from the same group, and therefore probably taken at around the same time, is of my grandfather Dirk Smit (1895-1985), standing in the entrance to a bell tent, with several other soldiers seated in various leisurely poses. This was while he was doing military service in the Dutch Army around 1914-1915. The third photograph is of a group of recruits in "A" Company of the 36th Battalion, Australian Imperial Force including, at front left, my great-uncle Hendrik Jan "Harry" Schipper (1883-1917). It was probably taken during training at Camp Rutherford, New South Wales in the winter or early spring of 1916. While the tent behind them is of a cottage tent design, rather than the bell, it shows a very similar wooden floor, raised a few inches above the ground, and with a shallow drainage trench surrounding it. My interepretation, therefore, is that the man with the bowler hat and cane is a soldier, but dressed in civilian clothing, perhaps on a Sunday, while receiving a visit from his family. The camp seems to be semi-permanent, as the occupant has gone to the extent of hanging some substantial decorations on the wall, two of which may even be photographic portraits. The third, central one looks more like a plate. To his left one can see what appear to be a couple of cooking pots and pans. There also may be some books on a table at the back of the tent. While the photographer may have travelled some distance to take this photograph - even to Shorncliffe, whose use for military purposes dated right back to the Crimean War - it seems more likely that it was a camp closer to Brighton. There was a military camp located at Seaford, not too far from Brighton, during the Great War, but I don't know when it was established.